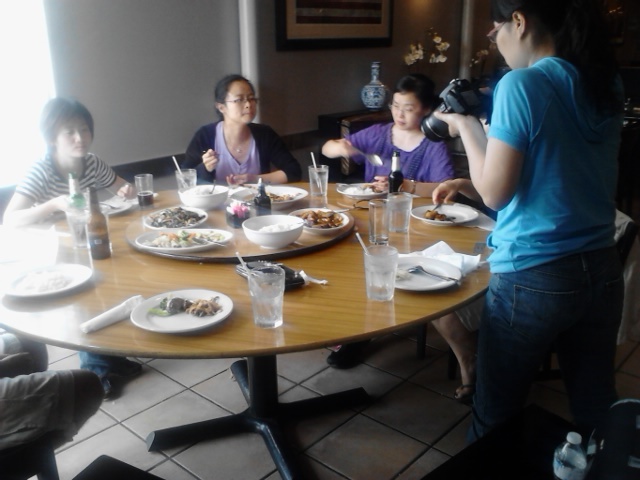 Chinese food with Chinese People! (and Niagara Falls) | The Food Hussy! 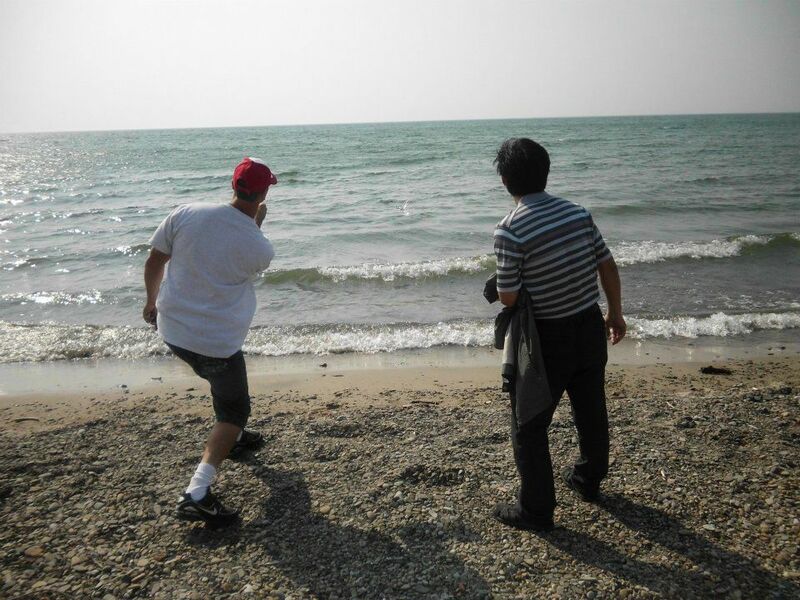 For a while now Larry and I have been doing volunteering here and there with International Friendship. It's a cool organization that works with students and professionals that come to the US and introduces them to Christianity and also provides temporary housing, rides to and from the airport, etc... It's very rewarding and fun - imagine traveling for 24 hours and landing in a country you've never been to and barely know the language - seeing a friendly face when you get off the plane would be really nice! 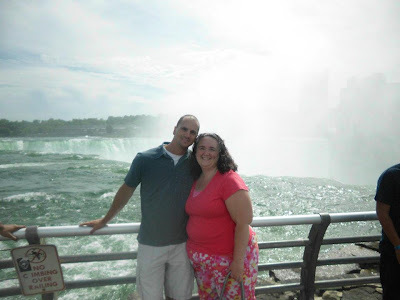 Recently - they took 3 vans of people to Niagara Falls for a conference and sight-seeing and they needed drivers! Larry and I saw this as a free vacation with the perks of making friends with new people so we signed up! Here we are in front of the Falls on the NY side. It was pretty breathtaking and as a Colts fan - he loved the one area shaped like a horseshoe - of course! 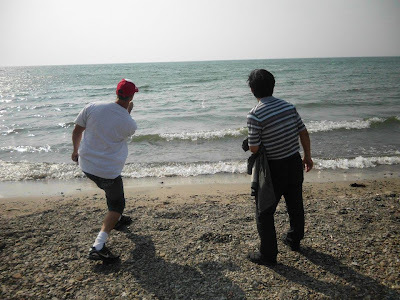 Another favorite moment was when Larry taught Gong how to skip rocks - something so simple breaks the language barrier and was so fun to see. We had 13 Chinese people that we were responsible for - but we actually stayed with a host family in the Buffalo area with five "girls". They were all doctors working at UC for 3 months-1 year. These girls were a hoot!!!! Al & Shirley (our hosts) said there home hadn't been so lively in years! 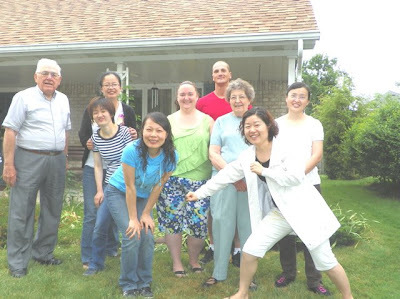 Imagine that - opening your home for 3 days to SEVEN strangers (like the Real World but much better). Because we spent so much time with these five girls, when we got back they wanted to take us out for Chinese food. I had to pick a place pretty quickly that was Chinese, more than a buffet and relatively close to Clifton. I decided on the Blue Gibbon in Paddock Hills. Let me tell you - hearing five Chinese people order Chinese food from a Chinese restaurant is a lot funnier than it sounds. Our waiter was Malaysian and just couldn't figure out what they wanted. 15 minutes later (poor kid) - a more senior staff member came out and in about 30 seconds - he had it all down. We were cracking up - we didn't understand a word and we had no idea what the heck we were going to eat - but it was entertaining nonetheless! 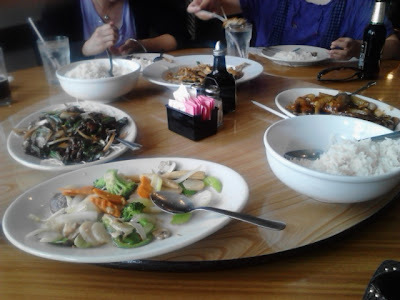 They ordered a smorgasbord of dishes - we all went around family style and it was all fantastic! There were things I'd had before (Mongolian Beef) to things that were completely new to me (a steamed fish dish - wow). 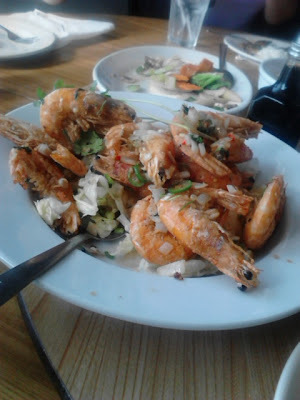 I even tried Prawns! These were a lot of work to eat and those eyeballs staring at me were not helping things - but I tried everything. It was all really great - I'm not sure how much attention I was paying to the food since we were laughing and reminiscing about our trip so much - but it was a great meal and we all left stuffed! Why Should You Go? It's not fancy by any means - but everything we ate was delicious! I'd say - ask for the Chinese waiter in his 30s and tell him - just give me something good - and I have a feeling - you'll be happy!